Weather here has been awful for DSOs. Not wet, but so much cloud. Stepped out tonight with super pair of Canon 10x30IS binoculars. Just down from Cassiopeia is a very pretty open cluster which is mostly naked eye visible but binoculars add so many more stars. The cluster is centred around alpha persei and all the members have the same proper motion across the sky – consistent with recent stellar genesis across the group – hence the “moving cluster” name. The cluster is also known as Melotte 20 and Collinder 39 from various catalogs and is also part of the Moore winter marathon. A Japanese astronomer has discovered a bright “new star” or Nova. It wasnt visible a few days ago but it certainly is now! A nova is a stellar explosion that occurs when a white dwarf star (comprised of dense non-fusing carbon and oxygen) in a binary system pulls too much matter (hydrogen and helium) away from its partner. If the white dwarf accumulates too much, a runaway nuclear reaction occurs and the extra material gets blown off in a spectacular explosion. The white dwarf can do this repeatedly as gas re-accumulates each time under the influence of gravity. Just below the lowest side of the triangle is the constellation Delphinus which looks like the outline of a fish – Find the dorsal and ventral “fins” of the fish and using the line between them as a guide go upwards until you find a cross-shaped cluster of stars. There is one further star just above the cluster – between that star and the cross-shaped cluster is a star just to the right – that is the nova. 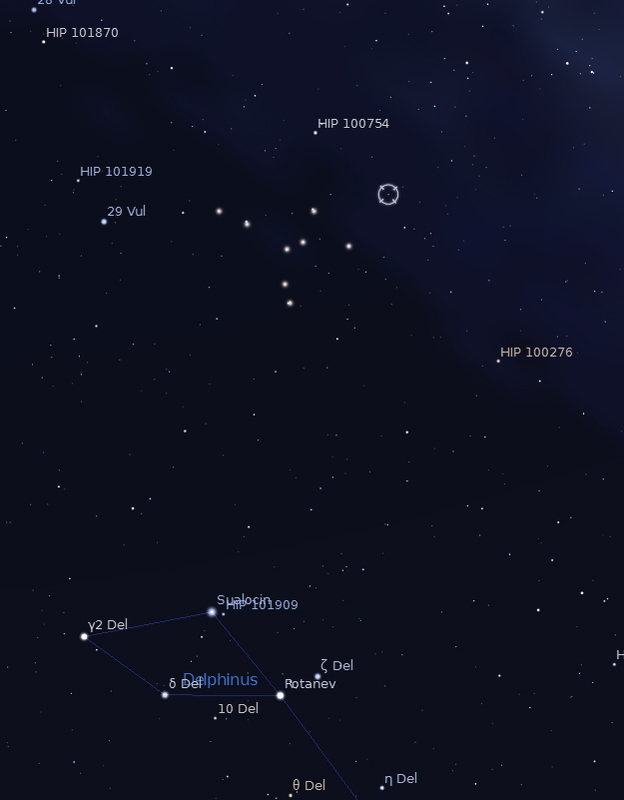 I have used Stellarium to make this map but have really exaggerated the brightness of the stars in the cluster to help you find it. The Nova is located at the circular target! Good hunting! Lot of cloud but no Moon – stayed out for just one hour. 8 meteors seen. 7 were Perseids and one was a coincidental. Any number of small satellites. Good views of Milky Way. Thought I could see the “Pipe” but might just be wishful thinking (see banner at top of page). French Lafuma Recliner chair is great! Able to get completely horizontal. It was purpose bought for meteor viewing. Off to bed with clouds closed in again. Weather forecast not great but will persist over next few days.